Robin Leong, Mike Stanley and Tom Blaisdell joined me for a breezy relaxing walk through Mitchell Canyon on Saturday, May 7, 2011. The consensus of several birders we encountered on the trail seemed to be that the bird activity was less than normal for this location and time of year, but we still managed to find quite a few interesting birds. Highlights included Phainopepla, 5 flycatcher species, 3 vireo species, Black-headed Grosbeak, Lazuli Buntings, and Western Tanagers. See the complete list below. Near the end of our walk Robin spotted a Horned Lizard, most likely the "Coast Horned Lizard," (Phrynosoma coronatum), designated a species of concern by the California Department of Fish and Game. The photo at the right is a public-domain image of a Texas Horned Lizard, which looks very similar to the one we saw. 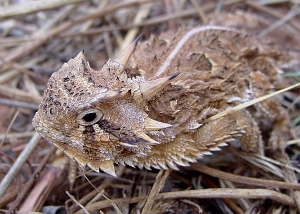 You can read more about California Horned Lizards on this web page by Don Roberson. Pre-Trip Description: Recent reports show a nice variety of songbirds moving through Mitchell Canyon in Mount Diablo State Park, including Cassin's and Warbling Vireos, Empid flycatchers, Western Tanager and Black-headed Grosbeak, and at least 6 warbler species. We will follow the main Mitchell Creek Trail for a couple miles and see what we can find. It is a gentle uphill grade through a riparian zone. The park gates open at 8:00 AM. There is a $6 per vehicle day use fee at the Mitchell Canyon staging area. We will finish our walk by 12 noon and be back to the carpool areas by 1 pm. Read more about these trips on the Saturday Bird Walks page. Directions: The approximate address is 96 Mitchell Canyon Road, Clayton CA 94517. Driving time to the Mitchell Canyon staging area from Vallejo is about 45 minutes in light traffic. From the Benicia bridge/I-680 South, one possible route is to take the Treat Blvd. exit, go EAST on Treat Blvd., RIGHT on Bancroft rd., LEFT (EAST) on Ygnacio Valley Rd., then after ~4.5 miles turn RIGHT on Pine Hollow Rd., then RIGHT (SOUTH) to Mitchell Canyon Rd., which takes you to the park gate. Look for the green Subaru in the parking area. Click here for a Google Map with instructions.